How obsessed is the Financial Times with Gold? 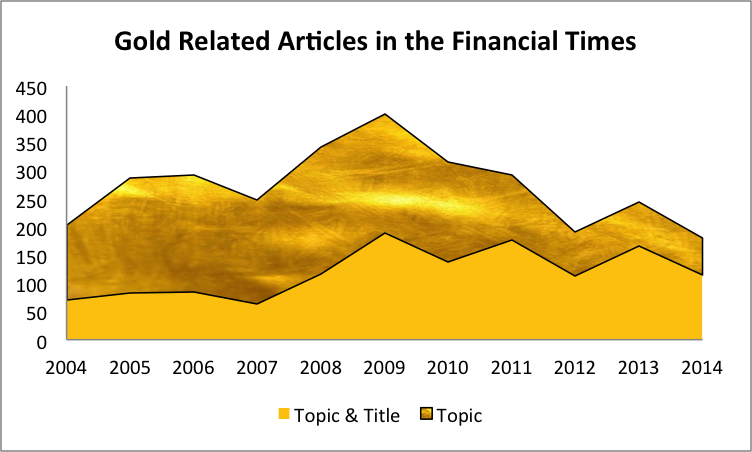 The chart shows the annual number of articles published in the Financial Times about gold between 2004 and 2014 from the FT Interactive Database. The total height represents all articles filed under the topic Gold by the Financial Times editors. The lower portion show the number filed under Topic: Gold as well as having gold in the title. So the number under the topic gold was 401 in 2009 and 212 of those (53%) also had gold in the title. This entry was posted in Blogpost and tagged financial times, gold, goldbugs, newspapers on February 27, 2015 by brianmlucey.